System which protects the driver and front passenger in the event of a serious side impact in order to limit the risk of injury to the chest. Each side airbag is built into the seat backrest frame, door side. The side airbags are triggered unilaterally in the event of a serious side impact applied to all or part of the side impact zone B , perpendicular to the longitudinal centreline of the vehicle on a horizontal plane and directed from the outside towards the inside of the vehicle. 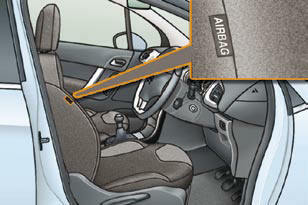 The side airbag infl ates between the front occupant of the vehicle and the corresponding door trim panel. System which protects the driver and passengers (with the exception of the rear centre passenger) in the event of a serious side impact in order to limit the risk of injury to the head. Each curtain airbag is built into the pillars and the upper the passenger compartment area. The curtain airbag is triggered at the same time as the corresponding side airbag in the event of a serious side impact applied to all or part of the side impact zone B , perpendicular to the longitudinal centreline of the vehicle on a horizontal plane and directed from the outside towards the inside of the vehicle. 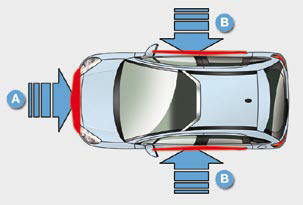 The curtain airbag infl ates between the front or rear occupant of the vehicle and the windows. If this warning lamp comes on on the instrument panel, accompanied by an audible signal and a message on the multifunction screen, contact a CITROËN dealer to have the system checked. The airbags may no longer be triggered in the event of a serious impact. In the event of a minor impact or bump on the side of the vehicle or if the vehicle rolls over, the airbag may not be triggered. In the event of a rear or front collision, the airbag is not triggered. Use only approved covers on the seats. These will not hinder infl ation of the side airbags. Consult a CITROËN dealer. Do not fi x or apply anything to the seat backs. This could cause injury to the chest or arms if the side air bag is triggered. Do not sit with the upper part of the body any nearer to the door than necessary. Do not fi x or apply anything to the roof. This could cause injury to the head if the curtain airbag is triggered. Do not remove the grab handles installed on the roof, they play a part in securing the curtain airbags.